To the eye, scoliosis appears as though the spine has been turned on its axis, like a corkscrew. The normal spine has a subtle curve. With scoliosis, the spinal curvature is severe. Scoliosis causes a lack of symmetry throughout shoulders, trunks, and waistlines. Mild scoliosis may be barely noticed. With severe forms, persons may experience more pronounced disfigurement, with resultant back pain and postural fatigue. In most scoliosis cases, the persons affected will need to watch closely and follow up with our practice if the curve should begin to worsen. In this case, your orthopedic doctors will examine the spine and observe the progress of the deformity by using a series of x-rays. For certain cases, as the spine continues to grow, your orthopedic doctor may recommend the use of a brace. Physical therapy exercises have not been shown to be an effective treatment for scoliosis. Common surgical treatment for scoliosis requires a spine fusion using special stainless steel rods, hooks, and a bone graft. The orthopedic surgeon attaches rods to the spine with hooks and the spinal curvature is carefully straightened. They then place small strips of bone graft over the spine to fuse it into a straight position. The bone graft heals over several months. Where the rods and bone grafts are, the spine will be solid and will not curve again. 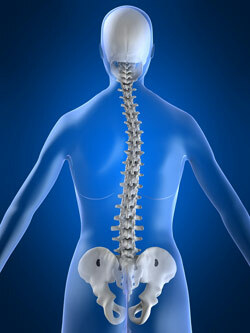 The part of the spine that has not been fused will continue to be flexible and will allow nearly normal movement.